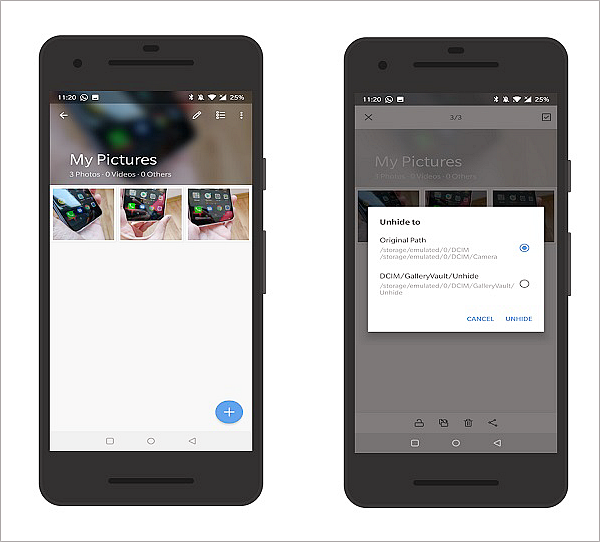 You probably keep a lot of pictures on your Android smartphone or tablet. But if you share your handset with someone else in the household, whether it’s your child or an older parent, you might want to make sure that some of these images remain private. We all have pictures we don’t want to share, and if that’s your case, no judgement. However, if you are serious about preventing others from seeing your pictures when they use your phone, you’re advised to take some precautions. Fortunately, there are several ways you can employ to hide photos on Android. One involves taking advantage of the phone’s built-in private mode, while another relies on third-party private pictures app do so. Below we’ll show you three different methods that will help you hide pictures on Android using settings or through a photo lock app. Most phones today have a special option of some kind that allows you hide photos on Android without the need to install a photo hide app. Some devices include a private mode, while others let you hide certain apps from view. It depends on the model and the manufacturer. So how to hide pictures on Android? Here’s how to do it. A lot of people own Samsung phones, and the good news is that the Korean tech giant outfits its phones with a very straight forward secure mode you can easily access to hide pics. Open up Settings on your Samsung phone. Search for Privacy and safety > Private mode. You’ll need to choose your Private mode access type, which includes a Pattern, PIN, Password or Fingerprint. 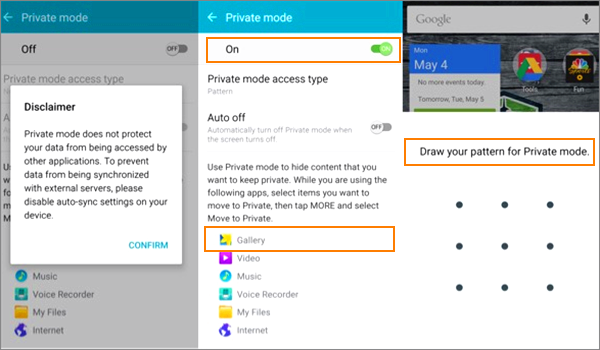 Every time Private mode is toggled on, users accessing the phone will be prompted to enter a PIN, use the fingerprint or enter a password to access certain content. Open the Gallery app and find the photo you wish to hide. Tap on it to open it. Tap More on the top right. Select Move to Private from the drop-down menu. In case you don’t want the picture to be hidden anymore, tap More once again and then select the Remove from Private option. You’ll be asked to choose the folder you wish the photo be restored in. As we told you above, the process of how to hide photos on Android and its related options vary greatly from model to model. For example, if you own a OnePlus device you will be able to take advantage of slightly different alternatives. The first one involves locking the apps you want to restrict access to. Open up Settings on your OnePlus phone. Scroll down until your find Security & lock screen under Personal. Find the App locker option which sits under Privacy. You’ll need to confirm your PIN or pattern. From here you can add the apps you want to be hidden from view including the Gallery. Set a PIN or another authentication method for it. With App locker on, users trying to access these apps will have to input the PIN or pattern you’ve chosen. Another option would be to use OnePlus’built-in Hidden Space option which can act as a picture hider. 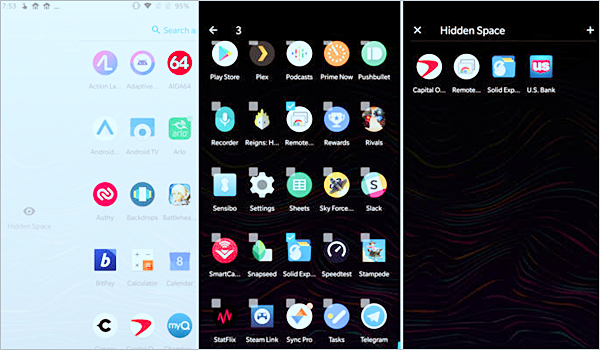 Open the app drawer on your OnePlus device. Swipe left to make the Hidden Space appear. Press the “+” button to add apps you want to hide. In case you change your mind, long press on the app’s icon and select Unhide. Still wondering how to hide pictures on Android? If for some reason or another, the first method is not a match for you, we have another one to share. This one is an individual picture hider rather than full app hider. 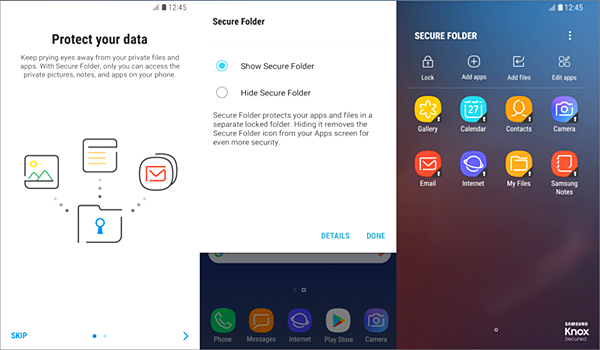 If you’re the owner of a newer Samsung device, you have the option to use Secure Folder, a kind of private pictures app. So here’s how to hide photos in gallery, but not the whole gallery using this option. Open up Settings on your Samsung devices. Find and tap on Lock screen and security. Choose a lock method you wish to use to protect your Secure Folder. A shortcut to the Secure Folder will pop up on the Home screen. Once the Secure Folder is in place, you can easily hide individual photos by opening the Folder and tapping on Add files. But what if you want to hide the Secure Folder? Luckily, you can. Swipe down to reveal the quick panel on your Samsung phone. Tap the Secure Folder icon to hide the Secure Folder contents. If you want to show the Secure Folder again, re-tap the Secure Folder icon in the quick panel. As it was the case with the first method, trying to hide individual files differs based on the phone model. 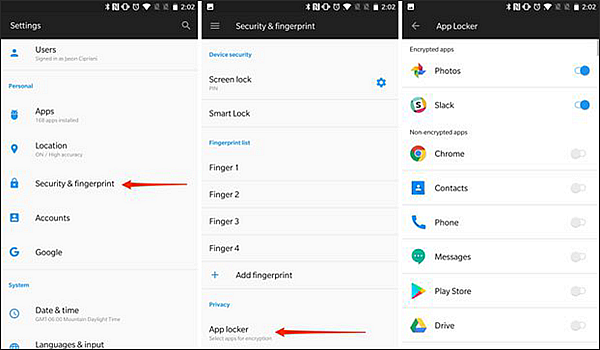 On OnePlus devices, you have the option to use the Lockbox. This is a best hide app for Android alternative. Access File Manager on your OnePlus device. Find the pictures you want to hide by browsing the Images folder. Long tap on the image you want to be hidden from view and then tap the three-dot menu in the top right corner. Tap on Move to Lockbox. Once the Lockbox is created you’ll be asked to pick a PIN made up of 6 numbers. And each time someone will want to access the Lockbox they will have to input that PIN. Now, let’s say you have a very old phone that doesn’t come with any of the options that we talked about above. Don’t worry, you can still hide photos on Android if you want to. Get a third-party photo hide app and you’ll be good to go. 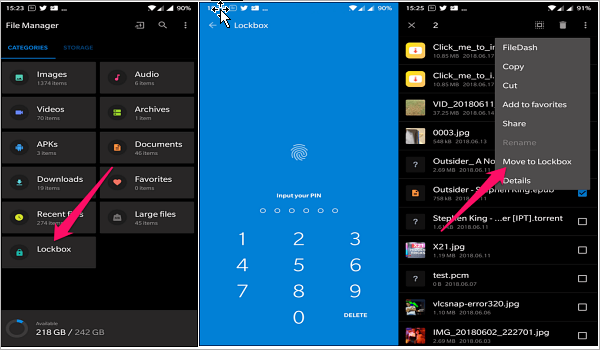 Below you will find three examples of such gallery lock apps you can download right now for free. 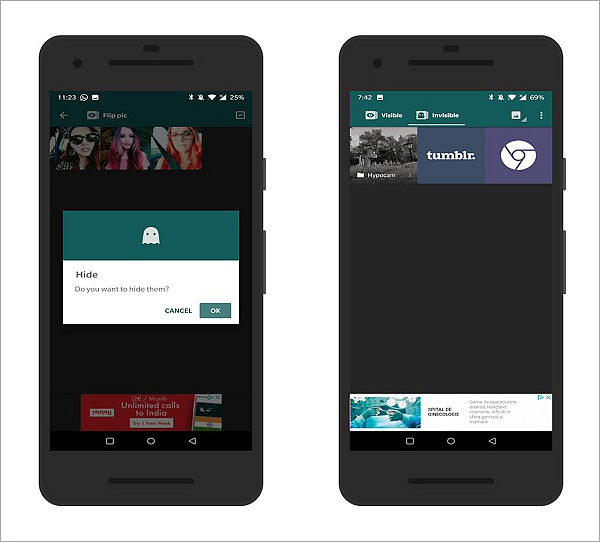 Gallery Vault is a very straightforward hide gallery app that’s also very intuitive to use. It lets you hide pictures, videos, cards and IDs, as well as important documents. To get started you’ll need to set up a PIN and a recovery email, and then you can proceed to make your stuff private. Simply choose your category by tapping on Photos/Videos/Cards/Documents. Tap the floating “+” button on the bottom right to add pictures. This will open up a list of your photo folders. Select which images you want to hide. The images will be encrypted and added to the Photos folder. To unhide them, simply long tap on the pictures and tap on the Unhide icon at the bottom. Gallery Vault is an extremely easy-to-use secret photo app. You don’t need to be an expert to give it ago, which is why we highly recommend you try it. Hide Something is definitely among the best app to hide photos, as it is very intuitive to use. It’s built with one purpose in mind and that’s to help you keep things private and it does this job very well. If you’re using the app for the first time, you’ll need set a pattern and add a recovery email. So this is how to how to hide photos in gallery using Hide Something. Tap on the Visible tap at the top of the app. Choose whatever pictures you want to hide. Tap the cute Ghost icon in the top left corner to hide them. Wait until the app completes the process. Go back to the main screen and check out the Invisible tab to see all your private pics. To unhide the images, simply select the ones you want to unhide and tap on the Eye icon to make them visible again. Hide Something is a minimalist best app to hide photos when it comes to functions, but it does deliver on its promise. So if you were looking for a simple photo security app, Hide Something might be exactly what you need. Don’t hesitate to download one of the best apps to hide pictures. Another alternative to hide pictures on Android is using Keepsafe Vault. Unlike the gallery lock apps we discussed so far, this one will need you to sign-up with an account. Fortunately, the process doesn’t take too long and you’ll be ready to start hiding pics in no time. Obviously, you’ll need to set a PIN before you can begin to use this hide gallery app properly. The interface is quite similar to the Gallery Vault’s. You have four categories at your disposal including Main Album, Cards & IDs, Videos and Significant Other. Tap on the folder you wish to add to. Tap on the floating “+” button to add photos (or videos). Select Import photos and find the photos you wish to hide. Tap on them to select and then click on Import. The image should show up in the folder of your choosing. To unhide pics, simply long press on them and tap on the Export icon at the bottom of the app. Like all the other apps in this list, Keepsafe Vault is a free-to-download secret photo app. It’s also Ad-Free, so you’ll be able to go about your business in peace. Photographs are the most precious treasure in our lives. Although the time can’t be kept, photos can help us record every wonderful moment in our lives, such as the people we met, the things we experienced, the scenery we have enjoyed, the delicacies we tasted, the novelties we have seen, etc.,.its importance is self-evident! However, small accidents will inevitably occur in life. In addition to protecting our privacy photos from being snooped, we also need to know how to quickly retrieve these important photos from your phone if they have been lost or deleted by accident. Well, here I recommend a powerful data recovery software for you in case of a rainy day! iReparo for Android, a professional Android data recovery software specializing in helping users recover various kinds of deleted files, such as contacts, messages, call logs, photos, music, videos, WhatsApp and Viber chats, etc from Android phones and tablets. It works perfectly with Samsung Huawei, HTC, LG, Google Pixel, Motorola, OnePlus and other brands of devices. 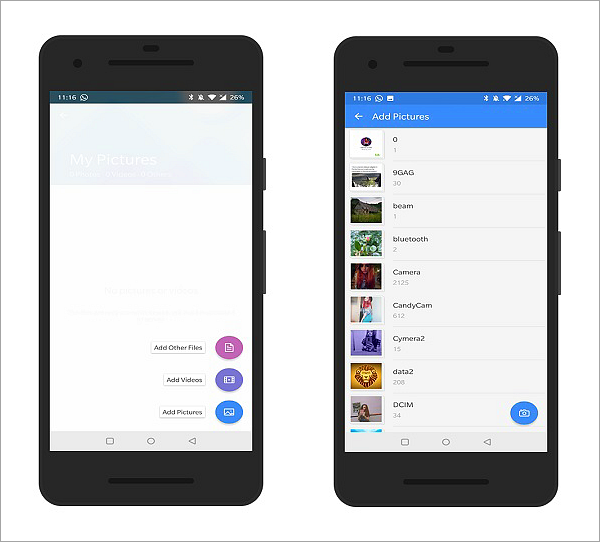 No matter your photos are lost or deleted for whatever reasons, you can quickly recover deleted photos from Android phone with this freeware. Now, you only need to click on the button below to get the magic tool. There’s no escape from embarrassing media. We all have some pictures or videos we’re not proud of, but for some reason still want to hold on to. Luckily there’s nothing your Android phone can’t do including acting as a photo locker. And even if you don’t have a modern smartphone, there are apps out there that can provide you with this functionality. If you know a best app to hide pictures for Android, don’t hesitate to share it with us in the comment section below. We’d love to know!